I am entirely won over by Autumn's charms now, happy to let summer fade away. The first evening fires of the season and a basket brimming with yarn make my heart beat with contentment. There truly is no better time to be a knitter than Autumn, it is so gratifying to pull out the woollen scarves and cast on for a new sweater. On Friday a nip in the morning air and a browse through the latest Toast catalogue filled me with an immediate need to cast on for something new. A pair of Toast of course, as created by the very lovely Leslie at A Friend to Knit With. Cast on for the first one on Friday evening and cast off the second on Sunday, wore on Monday. So very gratifying. This time I used a yarn new to me, Sirdar Balmoral , a really rather nice and very reasonably priced combination of wool, alpaca and silk. I may even knit up a sweater in this, I just wish they would broaden the colour range. I clicked on the link for the yarn and boy, so many nice patterns! problem with winter knitting is that by the time I've finished a sweater, it's summer... Have you ever been to P/hop by the way? They have a gorgeous pattern for fingerless gloves. (I use mine to keep warm when I'm working, as I sit still all day). Such gorgeous knitting!! Makes me want to abandon the jumper I'm knitting and cast on for these right away - in fact I might do just that! That's an interesting new Sirdar yarn, I hope my lys will carry it. Yes, I wish Sirdar yarns had more colours. Oh these are lovely! I love my pair of Toast from a few years ago, but I might just need another. It's too bad I can't find the sirdar yarn over here, looks wonderful. Your Toast-y mitts are beauties. Isn't Leslie's pattern wonderful? Thank you also for the tip on the Sirdar yarn. I love those, they are so perfect for winter when you don't want the hassle of gloves, but you want to keep your little hands warm! I've misplaced mine from last year - thank goodness they are a quick knit! gorgeous knit and love the colours! my problem with winter knits is that I keep casting on more and more projects and never completing any! What a fantastic color! I think I need a pair of these. Off to find some yarn. Have a wonderful day! Very, very pretty -- and so useful! I, too, am feeling the urge to knit that comes every year with autumn -- if I could just get my current quilting project finished! 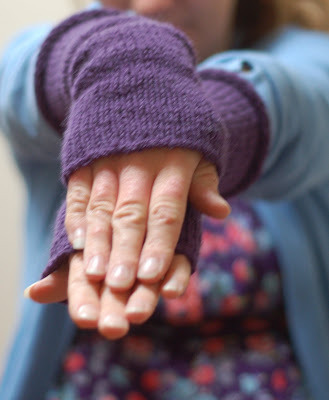 I just love arm-warmers, and these are gorgeous! That plummy purple with the moss green you are holding is pure autumn isn't it?